First Line: He sent his mind in search of me that morning. Margaret Ross brings a family heirloom into the London art gallery where Nicola Marter works. Ross has been told that the small wooden bird was given to a member of her family by the Empress Catherine of Russia. It doesn't take much imagination to realize that the woman hopes the heirloom is worth a lot of money, but with no proof there's really nothing the gallery can do but send the disappointed woman on her way. However, the problem really lies with Nicola. She has master's degrees in Russian studies and art history. She speaks fluent Russian. And she has another ability that she doesn't speak of: she can hold an object and see past events. Nicola has held the little bird, and she knows Margaret Ross was telling the truth. She's also glimpsed into the woman's life, and since she's traveling to St. Petersburg in a few days, she feels she must do what she can to authenticate the object. But first she has to travel to Scotland to enlist the aid of Rob McMorran, the young man she met in a psychic study whose powers are even stronger than hers. 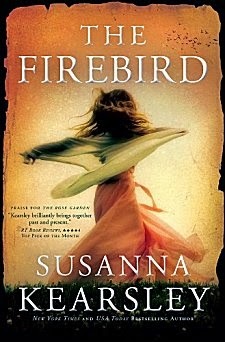 I have enjoyed every novel of Susanna Kearsley's that I've read. She has a talent for writing romantic suspense set in two different timelines. In The Firebird, we have Nicola and Rob traveling first to Belgium and then to Russia in the present day in an attempt to authenticate Margaret Ross's heirloom. The second timeline involves the little girl that the wooden bird was given to-- a time shortly after the death of Peter the Great, a time when a Stuart was trying to retake the throne of England, a time when the English were doing everything in their power to prevent that from happening. The present day timeline is a good one. Nicola and Rob are two strong, fascinating characters whom you want to see getting together. Nicola has always been afraid of her gift and hasn't really explored how far she can go with it. Rob on the other hand is the "old hand" (and the old soul) whose patience and steadiness are exactly what Nicola needs. But as strong as their story is, it's not the heart of this book. No, the heart of the book belongs to young Anna Logan, who spent the first years of her life unaware that she was living with a foster family. When the political situation takes a deadly turn, Anna is told a portion of the truth of her heritage, and she's spirited away to a convent in Belgium before finding herself in St. Petersburg. This girl will steal your heart. She's smart, she's observant, and she's incredibly brave. She may be old beyond her years, but she's still a little girl whose naivete has dire consequences. After all she's been through, you just want things to go right for Anna. Kearsley put me right smack in the middle of that Belgian convent and before I knew it, I found myself in Russia. Anna Logan's story is compelling, and Kearsley does an excellent job of showing what happened to so many of the Jacobites who fought on the losing side. If I have any quibble about The Firebird it's that this historical storyline is so strong that the one in the present day pales by comparison. I really liked the characters of Nicola and Rob, so I do wish their story had been beefed up a bit. But that is a very small quibble indeed because each time I picked up this book, I lost myself in Kearsley's marvelous story. I will say that I have never read a book by Susann Kearsley and I have meant to. I think someone told me that The Shadowy Horses is a good one. In any case, if you think she writes a good romantic suspense, I should try one. Thanks, Cathy! You're welcome, Kay. I think I may have Shadow Horses sitting on my TBR shelves. This isn't the first Kearsley I've read, and it won't be the last.